“…Their playing is intense, powerful and masculine, and their performance catchy and full of fresh energy..”(Klassiek Centraal). On: Strauss’ Sonata in E flat major Op.18: “….Strauss loaded his sonata with many of the same trademarks heard in his operas and tone poems …..Add to those strategies the duo’s zero tolerance for throw-away passages; the players invested every phrase with structural and expressive import, integrating each passage deliberately into a grand scheme”. 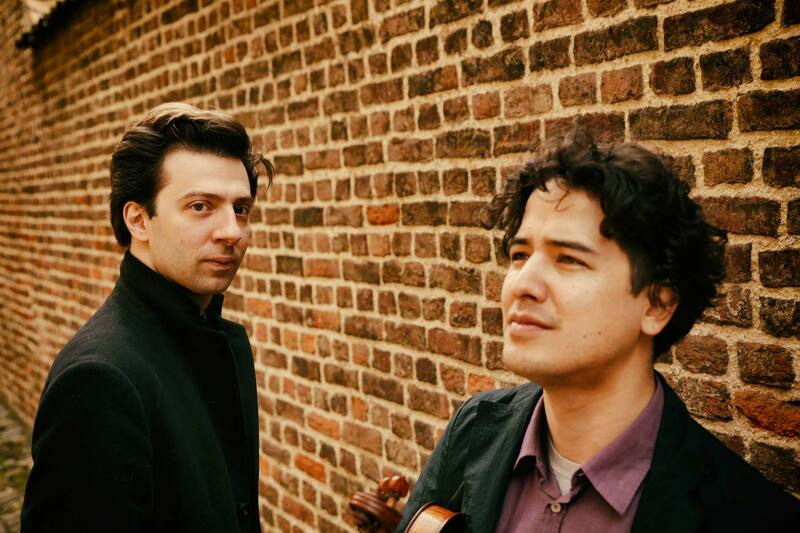 An irresistible combination, this duo of violinist Noé Inui and pianist Vassilis Varvaresos. Since their first joint rehearsal, in 2012, it immediately was clear that this would not be a cooperation for short term only. It is as if they speak the same language, united as they are during their concerts, which is visible and noticeable until the back rows of the hall! 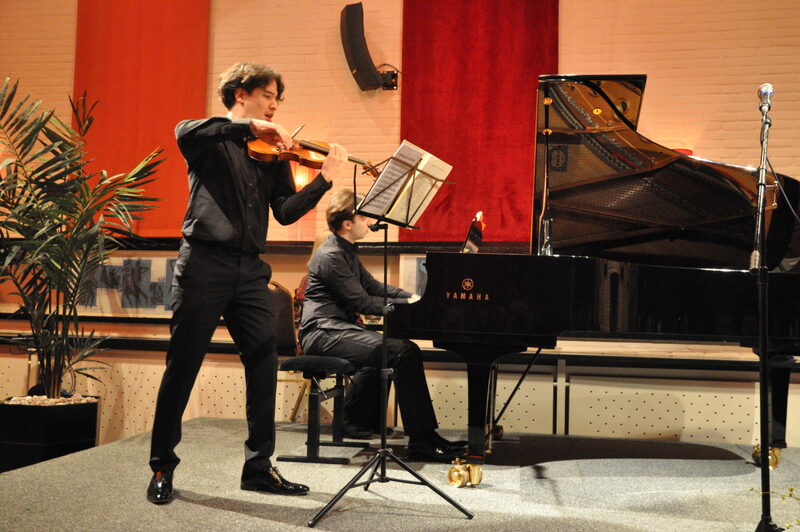 As a duo Noé and Vassilis performed several times in prime venues in the US, Japan and Europe. In 2016 they made their publicly and critically acclaimed début in a sold-out Amsterdam Concertgebouw. In The Netherlands they performed a.o. in The Hague (Diligentia and Nieuwe Kerk), in Concertgebouw Amsterdam, Haarlem Philharmonie and the Vereeniging/ Nijmegen. Their first CD on Navis Classics, featuring Strauss Sonata op.18 and Schumann 2nd Sonata, has had its release in autumn 2015 and received both in Dutch and international papers and music magazines nothing but 4 and 5* reviews. Together with cellist Benedict Kloeckner, Noé and Vassilis are playing together in piano trio Trio Bell’Arte. Together with violist Georgy Kovalev and cellist Ella van Poucke, Inui and Varvaresos are part of Pianoquartet Corneille, an ensemble that has played numerous times in halls like Concertgebouw Amsterdam, Doelen Rotterdam and De Vereeniging in Nijmegen, in concerts that were broadcasted live on Dutch National Radio. Greek/Japanese violinist Noé Inui (1985) is prize winner of various international competitions, such as Young Concert Artists New York, Sibelius/Helsinki (Young Talents’ Prize) and was awarded the top prize (Prix Julius Baer) of the Verbier Festival Academy 2012. As a soloist Noé performs frequently with orchestras in Germany, Belgium, Holland, Greece, Spain and Japan. As a chamber musician he gave recitals in many European countries as well as in the US, Japan and in The Netherlands. He shared the stage with among others Martha Argerich and Leonidas Kavakos. Noé recorded several CD’s, both solo and with his former trio, Carlo van Neste. Greek pianist Vassilis Varvaresos (1983) was in 1998 the youngest winner ever of Young Concert Artists in New York, followed by various international prizes: his most recent ones at the prestigious Enescu Competition/Bucharest and the Monte Carlo Piano Masters. In March 2012 Vassilis had his first solo recital in Carnegie Hall and after that was invited by President Obama to perform at the White House. This “Most Promising Young Greek Artist” is playing both as soloist with orchestras as well as in recitals in venues like Salle Gaveau/Paris, Tonhalle Zürich and the Wiener Musikverein. Vassilis has recorded 4 CD’s, two solo-CD’s, one with violinist Noé Inui and one with baritone Dimitris Tiliakos ‘Winterreise’; ‘V for Valse’, his latest album has been released in May 2018 in Paris.